Regularly I get questions about how I transfer my embroidery patterns to fabric. For a long time I mostly answered it with 'a water soluble marker'. However recently I had noticed that some of my embroidery work had yellow-y stains. 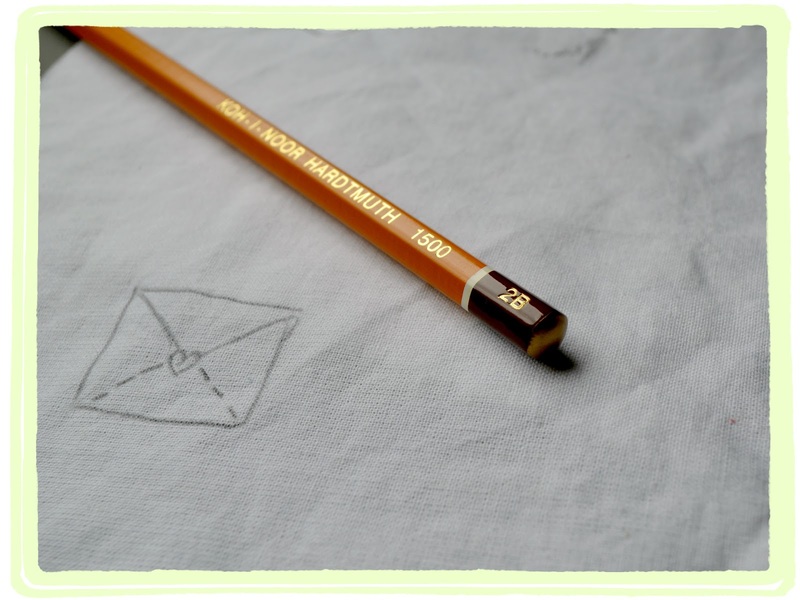 I wasn't sure what caused it until I read this blogpost on Mary Corbet's Needle 'n Thread blog. So while it isn't 100% proven that the blue water soluble markers caused the stains on my embroidery work I am definitely more cautious about using them. I mentioned this on my Facebook page and Judith (a very talented stitcher, check her work here) suggested using a 2B pencil instead. Now the wonderful thing about the blue markers was that I could change a design halfway a project and wash away the lines (or so I thought) so I thought I'd do a little 2B experiment to convince myself this ordinary grey pencil could do the trick too. I have also read that some people use a HB pencil for tracing which is a slightly 'harder' pencil. The higher the 'H' number a pencil has (9H for example) the lighter the mark. High 'B' numbers are soft pencils which give dark (black) marks. An HB pencil is right in the middle. 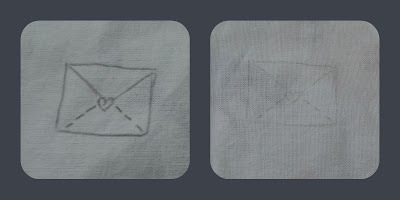 I traced the little envelope (it's from this pattern sheet) by sticking the pattern to the window, putting the fabric on top and tracing the pattern onto the fabric with the 2B pencil (photo on the left). After that I tried to wash it out by simple rinsing it with water (photo on the right). The traced image is not completely washed out but has faded a lot. After that (not pictured) I used some detergent for hand washing clothes (and water obviously) and the marks seemed even less visible after that. So...all in all I'm not unhappy with the results. Tracing with a regular pencil has a lot of advantages. Pencils like these are always on hand and the transferred image has fine, delicate yet clearly visible lines. Certainly for designs that you are not planning on changing halfway this is a method of transferring worth trying out! There's a few other things I wanted to share with you. I started a new (smaller) shading/furry stitching project. And yes I traced it onto the fabric with a 2B pencil as well! More about this project later this week. 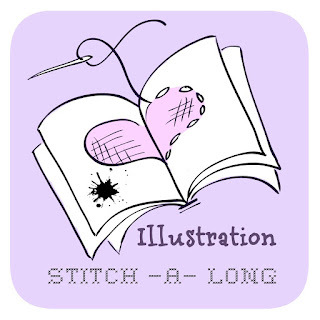 Recently I wrote about the fabulous Illustration Stitch A Long me and Bridgeen are hosting on Flickr soon (starting January 2013). 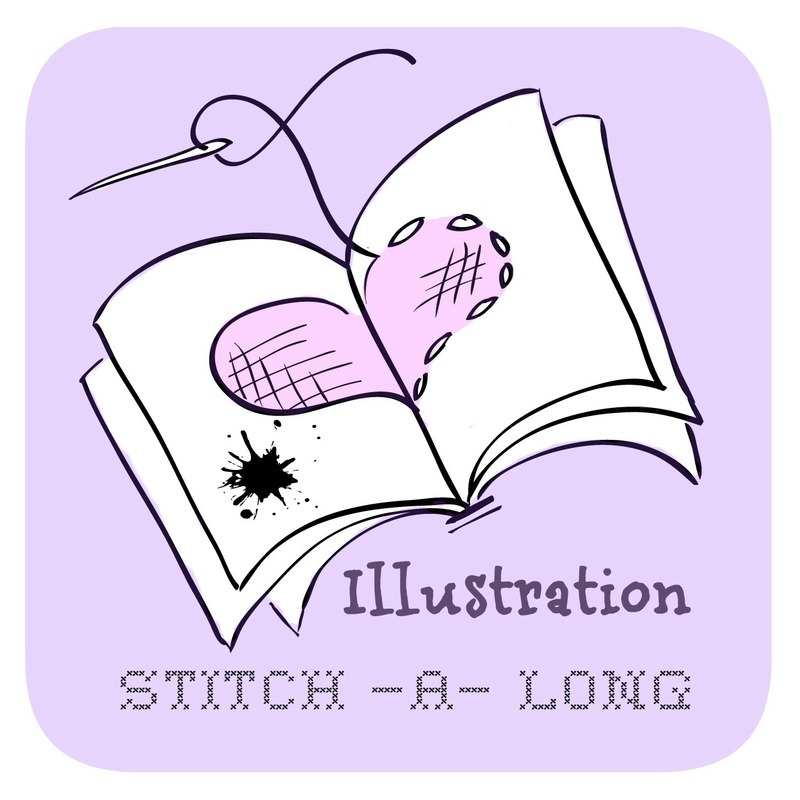 You can grab the button if you are stitching a long with us or want to promote it on your blog. P.S. Less than one day to enter for the Mostly Ms Marvelous Rabbit Sewing Pattern Giveway! I used pure soap to wash off the pencil lines when I kept messing up the writing part on one of my recent pieces. No sign of the pencil at all after that. I used a 5b pencil as I didn't have to press as hard and it was on calico. Not sure if a different fabric would make a difference. The whole bottom half was a mess of mistakes. I ended up having to re do it about 5 times and each time it washed off fine. Hi Nicole: i use to own a quilt shop here in Canada and a supplier came in with these great marking pens that erase with the heat of an iron. They are called Frixion Eraseable Pens. You can find them at most quilt shops or google them in your area. These are a great option. Let me know what you think. Hi Peggy, thank you for your comment! I have actually read about these as the blogpost I was referring to on the Needle 'n Thread blog linked to this article: http://mythreesonsknit.blogspot.nl/2012/05/pilot-frixion-pen-sewers-warning.html Like with the blue 'water soluble' markers it seems there is always some kind of chemical residue left that can re-appear. As most of my embroidery pieces take me many many hours to make and I often stitch on light fabrics this worries me a lot! I use Sewline fabric pencils, I press lightly and I think they wash out well- I am not doing embroider, more for quilting, free motion writing etc but very good! 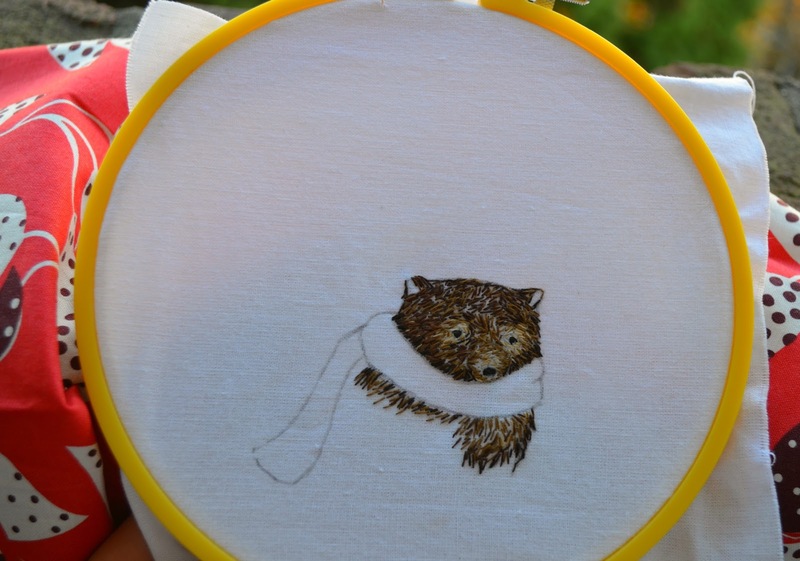 It's a very interesting topic for embroiderers and everyone has their own method. I stopped using water or air soluble pens because I found the design too difficult to see, so I've been using HB pencil for ages and it suits me well as long as I don't make any mistakes when transferring. I read Mary's post with great interest too. Your little furry guy project is looking very cute thus far! I've noticed brown marks from my water soluble pencil on my London Star cushion cover. I've just traced a big embroidery in water soluble marker but after reading this I am very tempted to do it again in pencil as I really don't want to spend a lot of time embroidering to then get upset about yellow or brown stains. I use regular pencils because they are 1.) redily available 2.) cheap & 3.) acid/ chemical free. As a historian, archivist in training & redwork lover, I gave up on anything other than pencil years ago.